Choosing the best resort for a honeymoon in the Caribbean is a bit like choosing an engagement ring. There are so many, they are all beautiful and there’s usually one that’s just right for you. The difference is, you’ll have your ring forever — but your honeymoon is just a few days … so you’d better get it right! CJ has you covered, with 25 of our top picks to make sure you have a trip that you remember for a lifetime. This boutique resort is perched high on a cliffside at the northern edge of Dominica. Even by the standards of remote Dominica, it feels a world away from everything. Luxurious, romantic and enchanting, it’s simply the perfect place for a honeymoon escape. Nothing says honeymoon better than a private island resort, and this gem in the Grenadines offers offers barefoot luxury in an exclusive, ultra-private setting. A throwback to another era of Caribbean luxury, this Jamaican legend has an almost indescribably enchanting quality. With just 36 rooms, it’s intimate and romantic. St Lucia is one of the more romantic islands in the Caribbean, and a honeymoon at Jade Mountain means 24-7 show-stopping views of the Pitons and your own private infinity pool. Tiny, green Nevis is all about magic. And from the minute you board the boat to the Four Seasons from St Kitts to late afternoons on serene Pinneys Beach, that feeling never ends. You might say Sandals redefined romance in the Caribbean, and the new Sandals in Grenada may have redefined Sandals. It’s a spectacular, modern property, perfectly tailored for a honeymoon. This villa resort in the Exumas offers you serious luxury and an even better honeymoon perk: your own private boat for the duration of your stay. This hidden wonder in Martinique is almost like a boutique villa resort — the expansive rooms all have their own plunge pools and spectacular views of the sea and a nearby lagoon. 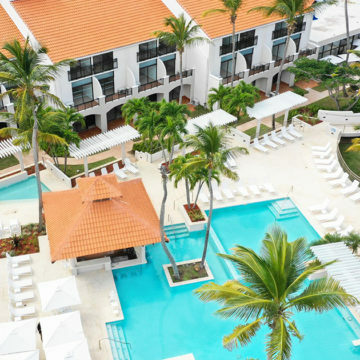 Set on one of the most stunning beaches in the Dominican Republic, this boutique villas resort is set in ultra-exclusive Cap Cana. (And it has its own Eden Roc restaurant to boot). A ride on a small propeller plane to Union Island, then a boat ride to a sandy, beachy paradise. It’s a journey that’s as romantic as it gets — and so is the destination. This eco-friendly boutique resort on South Andros island in the Bahamas is small, quiet and remote (accessible only by boat or seaplane). The perfect ingredients for a honeymoon. Long one of the flagship Caribbean resorts, Caneel Bay recently became an independent brand; but the resort, like St John, has retained its remote, idyllic luxury. It doesn’t get much cooler than this boutique gem in Negril. This exotic Jamaican hotel is also one of the region’s great values.